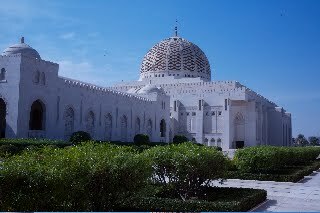 The Grand Mosque in Muscat Oman took 6 years to build and was inaugurated by His Majesty the Sultan in 2001. The entire site covers 416,000 square metres with The Mosque complex covering 40,000 square metres. It can accommodate up to 20,000 worshippers. 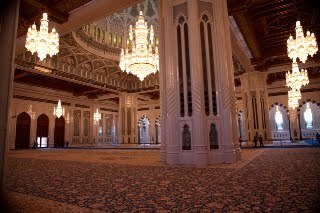 The interior of the Grand Mosque is lavishly decorated with marble adorned with ceramic floral patterns. The ceilings are inspired by Omani forts. The dome comprises a series of ornate, engraved stained glass triangles within a framework of marble columns, and a Swarovski crystal chandelier with gold-plated metalwork hangs down for a length of 14 meters. A major feature of the main prayer hall is the hand-made Persian carpet consisting of 1,700 million knots, weighing 21 tonnes and made in a single piece measuring 70 x 60 metres. It took 4 years, 600 female weavers from province of Khurasan in Iran to complete. Bad News ... It's Snowing in Liuyang ..